One of the cool things about movies is that they can bestow a measure of immortality even on people who didn't have extensive film careers but just happened to be in the right place at the right time. So it was with Bill Hinzman, who died Sunday of cancer at the age of 75. 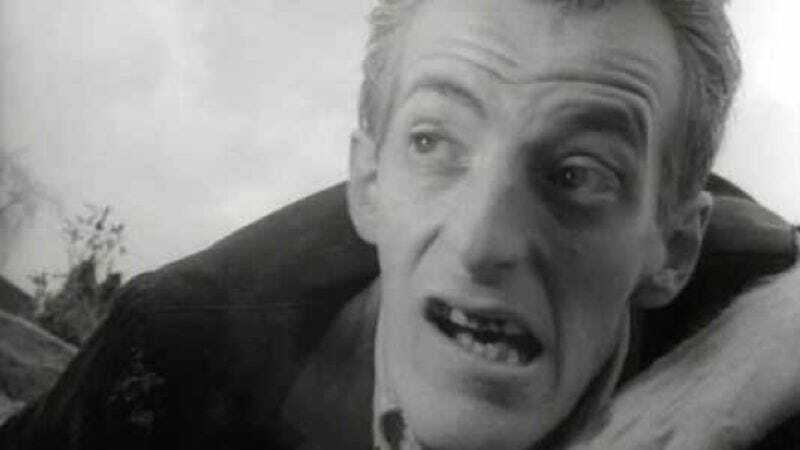 In his first on-screen role, Hinzman played the "Cemetery Zombie" who appears at the beginning of George Romero's 1968 horror game-changer Night Of The Living Dead. In the movie's opening scenes, the heroine, Barbra, and her brother Johnny are visiting their father's gravesite when Hinzman appears in the background and starts lurching in their direction. Appearing to set the tone for a playful Saturday-matinee scare show, Johnny starts teasing his sister for being nervous about being in the boneyard, then goofs on Hinzman's gaunt, awkward appearance. That’s when Hinzman staggers up, makes a grab for Barbra, smartly introduces her brother's head to the side of a tombstone, and we're off to the races. Hinzman was working on the movie as an assistant cameraman when Romero spotted him and knew he'd found his zombie muse. "We'd like to tell the story that it was a hard audition session," said Russ Steiner, who co-produced the film and played Johnny. "But Bill was there and old enough and thin enough and he had an old suit." Hinzman (whose name is spelled "Heinzman" in the credits of Living Dead) remained in Romero's orbit for years, working in a variety of functions on There's Always Vanilla, Hungry Wives, and The Crazies, as well as the equally chilling 1974 TV sports documentary O. J. Simpson: Juice On The Loose. Hinzman even directed a couple of those, including 1987’s The Majorettes and 1988’s FleshEater, while remaining a popular attraction at fan conventions. He also put the zombie makeup back on for a pizza commercial. Hinzman’s final credit was a prominent role—alongside professional wrestlers Kurt Angle and Kevin Nash—in last year's River Of Darkness.